Internet is flying high these days and it seems that everyone got website these days. Buying a custom domain is very easy and cheap but when it comes to designing of a website or a blog, it can be expensive. And most of the times, a new company or a startup can’t afford too much to give a company to design a custom website or blog. You can choose WordPress or BlogSpot to start a new blog and find free themes to start with. But sometimes you were not fully satisfied with free themes due to lack of customization features and some of you are not too good with the coding. But there is one thing good about internet that you can find everything if you digg it deeply. So, if you are not well-versed with coding, you still can create beautiful blogs or websites with the help of free online template generators. These template generators will help you to build your own website or blog if you are not fully satisfied with the present one. Have a look on SaveDelete’s compilation of 9 best and free online Template Generators for website and blogs. And if you know any template generator, which you feel suits best in this list, feel free to share with our readers in the comments section below. 1) CSSEZ : CSSEZ is an online based CSS authoring tool specialized for blog design. Users can create blog themes and templates for multiple blog systems such as WordPress and Movable Type simultaneously. If you register and create an CSSEZ account, you can insert your credit into created designs. One of the big features of CSSEZ is that users can share design he creates to other users. Thus, if you insert credits into your designs, you can increase backlinks for your site. 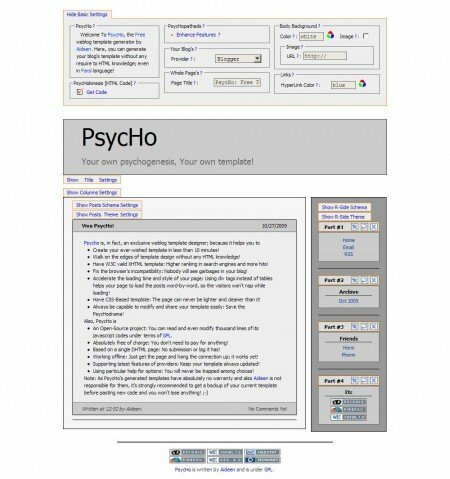 2) PsycHo : Free Template Generator : PsycHo, the Free Weblog template generator by Aideen. 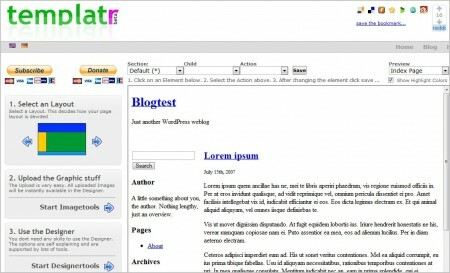 Here, you can generate your blog’s template without any require to HTML knowledge. You can create your ever-wished template in less than10 minute. Have W3C valid XHTML template: Higher ranking in search engines and more hits. You can also fix the browser’s incompatibility: Nobody will see garbages in your blog. Accelerate the loading time and style of your page: Using div tags instead of tables helps your page to load the posts word-by-word, so the visitors won’t nap while loading. 3) doTemplate : doTemplate is a catalog of free Web templates you can easily customize before download. Have a try or view demo and see how quickly you can create your own web design Even doTemplate themes are compatible with Blogger. 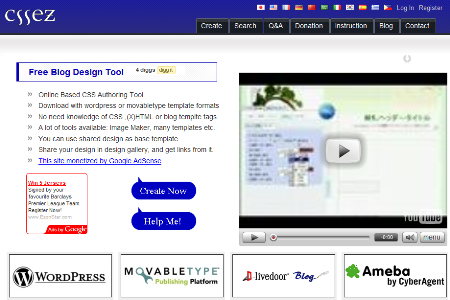 You can choose to download your template in XHTML format or Blogger format. Soon, they will coming with WordPress compatibility too. 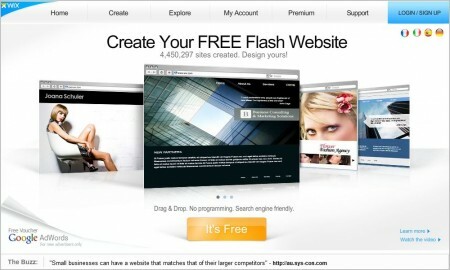 4) Wix : Free Flash Website Builder : Wix.com is a free Flash website builder that enables anyone to create a Flash website without the need to program or code. The Wix website builder is a simple and ideal solution for artists, photographers, musicians, small businesses, non-profit organizations, and anyone interested in a personal website with which to promote their products, services, cause or ideas. An intuitive drag and drop interface makes it easy and enjoyable to customize the design of Wix’s free Flash templates. Simply select a template from Wix’s beautiful Flash template galleries. Click “Edit”, and the template will be automatically placed inside Wix’s free website builder for you to easily customize. 5) HTML CSS PHP Website Template Maker : This PHP – HTML – CSS template generator creates a two column layout with both a header and a footer. 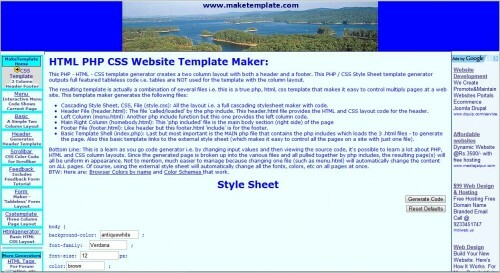 This PHP / CSS Style Sheet template generator outputs full featured tableless code i.e. tables are NOT used for the template with the column layout. The resulting template is actually a combination of several files i.e. 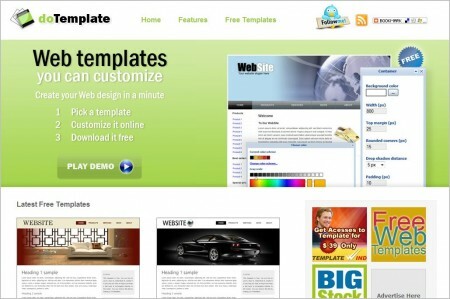 this is a true php, html, css template that makes it easy to control multiply pages at a web site. 6) WordPress Theme Generator : This online generator creates your own custom unique WordPress Theme. Without any need for HTML, JS, PHP, or CSS knowledge. Change the colors, settings, layout, preview live, click “save” and download your unique WordPress theme zip-file. Extract, upload, set, and you are done. 7) templatr : Templatr has more than 20 pre-defined layouts, and formatting options for various page elements including pages, header, footer, titles, margin, padding, border, and more for your WordPress blog. After you complete the designing of the template, you can download the template on your computer. 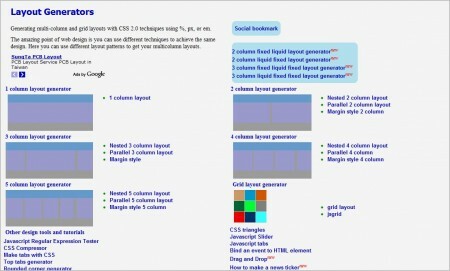 8 ) Layout Generators : If you know some coding, this can be a great site for you. YOu can generate multi-column and grid layouts with CSS 2.0 techniques using %, px, or em. 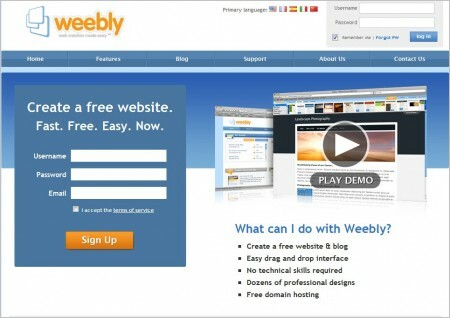 9) Weebly : Weebly is a neat site template generator.Choose their pre-defined themes and customize according to your need by placing ads, maps, contacts forms, videos, images etc. After your complete the customization, you can publish the site on your custom domain. is a Advertising Professional and running his own Advertising agency in Jaipur. Aside from his work, his other passion is blogging/writing.